Formula 1 is to impose changes to ensure an accident like the one that left Jules Bianchi in a critical condition cannot happen again. 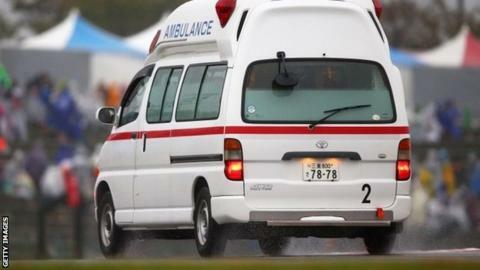 Bianchi suffered severe head injuries in Sunday's Japanese Grand Prix when he crashed into a recovery vehicle. Marshals were waving double yellow caution flags - the most severe warning before a safety car is introduced. Governing body the FIA is discussing steps to ensure drivers slow down more than they currently do for such flags. FIA president Jean Todt said: "We have to learn from what happened. "And we will because we cannot be faced with such a situation again. Each life is very important." FIA race director Charlie Whiting said that Marussia driver Bianchi, 25, like all the drivers, had slowed down, but some had reduced speed more than others. He refused to say by how much Bianchi had slowed. Whiting said: "There are some things to learn. We want to engage with all the teams and drivers to ensure we come up with good, sound and well-thought-through ideas. "One of the most important things to learn here is that it is probably better to take the decision to slow down away from the drivers, to have a system where it is clearer to everyone how much we think drivers should slow down. "That is what we are working on. "If you look at the history of Formula 1, and our journey through life actually, whenever we have moments that really stop and have people think then there is usually a reaction. So I expect the FIA, once they have conducted a full investigation into all of the parameters that led to the accident, will come with a series of [safety] changes. I believe there will be some changes made for this weekend as well and there is a meeting on Saturday morning to discuss exactly how they will be implemented. But it is inevitable that change is required." "We have a meeting with the teams on Saturday to discuss a way of imposing a speed limit. "It would have the same effect as a safety car because if you slowed everyone down to the same pace they would hold position." But he said it was "highly unlikely" that any new system could be introduced at this weekend's Russian Grand Prix because of the complicated electronics systems on the cars. "We have to ensure it works the same way on all the cars," Whiting said. "We will be exercising extreme caution as always." he added. Whiting said the FIA would also consider putting 'skirts' around recovery vehicles to ensure it was impossible for cars to go beneath them. He also said that a green flag seen waving close to the accident site in videos of the accident was correctly displayed. That was because the recovery vehicle had gone back past the relevant marshals post, which indicates the track conditions beyond that point, where there were no hazards. Whiting said the late start time of the race - at 15:00 BST when the sun sets in Japan in October at about 17:30 - was "totally unconnected to the incidents in question". And he rejected claims by Williams driver Felipe Massa that he had been "screaming on the radio" to try to get the race stopped because of worsening conditions. "That's not entirely true," Whiting said. "I don't think he was screaming. 'Track conditions are getting worse' was the only thing he actually said. I don't personally think that constitutes screaming. "But we don't listen to all the drivers at all times. We rely on the teams to tell us anything important they think we should know." Whiting said research into head protection in front of the drivers was ongoing but that it was "very difficult to find something that is strong enough to stop the wheel and allows the driver to drive the car without being affected by the structure".